This article contains facts and information about the life and times of the famous Native American Indian chief known as Chief Joseph. Who was Chief Joseph and why was this Native Indian chief famous? Summary: Chief Joseph (1840 - 1904) was a famous war leader of the Northwest Nez Perce Native Indians who fought against the white settlers who were confiscating Nez Perce tribal land. Chief Joseph formally surrendered to General Nelson A. Miles on October 5, 1877 in the Bear Paw Mountains of the Montana Territory. He died in 1904 in exile from his homeland. The following fact sheet contains interesting facts, background history and information about the life of Chief Joseph and the events in history that led to his fame as a great Native American Indian leader. Alternative Name: Hinmahtoolatkekt meaning "Thunder Rolling down the Mountain"
The distinction that Chief Joseph’s name had compared to other Native Americans can be traced back to his father, Joseph the Elder. He was the first Native American to establish a strong bond with the white settlers and had himself baptized in Christianity in 1838 and took up the name Joseph which was then passed down to his son. 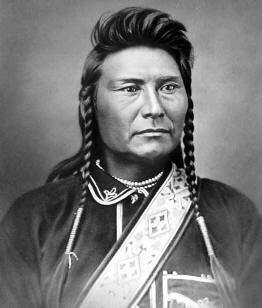 Chief Joseph was born in 1840 at Wallowa Valley in Oregon. Initially, his tribesmen referred to him by the name of Hinmahtoolatkekt which in their native tongue meant "Thunder Rolling Down a Mountain". 1861: More than 1000 gold prospectors arrived in Pierce, Idaho. 1877: The Nez Perce War (June - October 1877) led by Chief Joseph, his brother Ollikut, White Bird and Chief Looking Glass. On June 17, 1877 a force of 300 warriors routed the US soldiers at White Bird Canyon in Idaho but Chief Joseph realized he would not be able to compete against the full might of General Howard's forces . The Nez Perce fought a series of battles and skirmishes with General Howard and later, Colonel Nelson A. Mileson in a fighting retreat that covered 1,170 miles. They sought sanctuary with the Crow tribe but were refused help. The Sioux were unable to help as Sitting Bull and his warriors had been forced to flee to Canada following the Battle of Little Bighorn. The exhausted Nez Perce stopped at the Bear Paw Mountains in Montana, about 40 miles from the Canadian border. It was here that they fought a five day battle against Colonel Miles's troops. On October 5, 1877, Chief Joseph was forced to surrender. For additional facts and information refer to the legend and Story of Chief Joseph. Discover the vast selection of pictures on the subject of the tribes of Famous Native Americans such as Chief Joseph. The pictures show the clothing, war paint, weapons and decorations of various Native Indian tribes, such as the Nez Perce tribe of Chief Joseph, that can be used as a really useful educational resource for kids and children of all ages studying famous Native Americans such as Chief Joseph. We hope you enjoy watching the video - just click and play - a great educational resource for kids.